I have attempted to help make the use of browsers, and very importantly, the other web based programs like Java, Adobe Flash , etc. 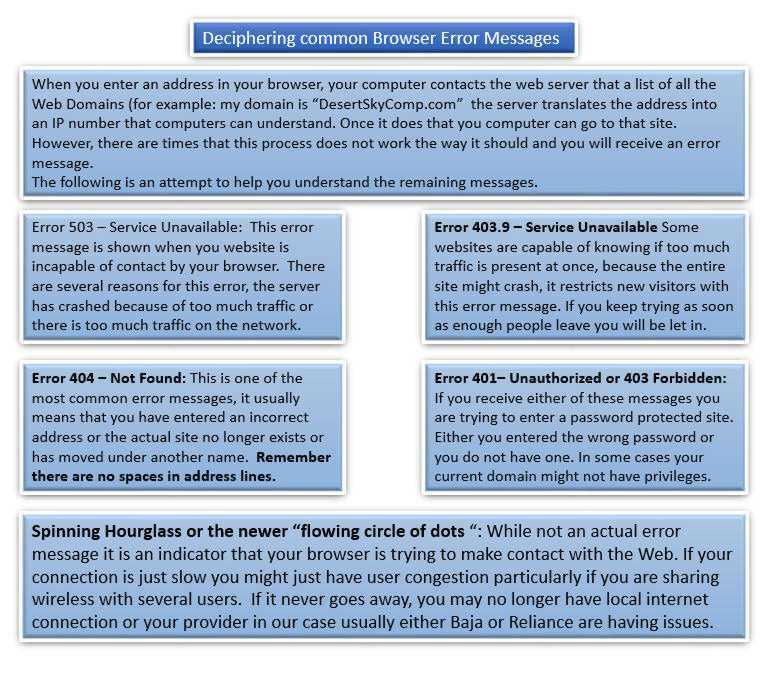 easy to understand so you can have the best and safest experience while using the World Wide Web also know as WWW or the Web. Search Engines are often confused as browsers like Google, Bing, Yahoo, AOL, etc. but are really nothing more than another website. The process used to communicate between computers and the Internet (World Wide Web) is called a client/server relationship. You run a web client on your computer we call a browser. Others like me, put data (like this webpage) on a web server. Most individuals use Internet Explorer because it is the one they received with their computer but several people choose to switch to other browsers or use more than one, like Firefox, or Chrome. Apple users normally use Safari. There is a new browser called Spartan. In tests I have performed it has compared very favorably with other browsers. All computers using Windows ver. 10 or above will be shipped with Spartan. One added benefit is that all phones and tablets that run Windows will be able to use the same Browser. When you enter an address or click on one of your "Favorites" in you browser client (from now on we will just call it a browser) it contacts the web server (from now on we will just call it the Web),which locates the requested information and it is displayed on our screen. The browser and the Web communicate with a language (one that I used to create this page) called Hypertext Markup Language. (HTML) Most browsers can use the latest version of HTML which is called HTML5. Each version of HTML has made web pages easier and much faster to not only create text and have it displayed like the we want but also how videos, photos, graphics are viewed. Each time a new version of HTML is created new updates are made to your browser so it can understand the language. That is why we now have Windows Internet Explorer 11 instead of version 6. HTML Versions usually keep some of the old code recognizable to older browsers so that individuals still using the older browsers can see most of the data in a recognizable way. 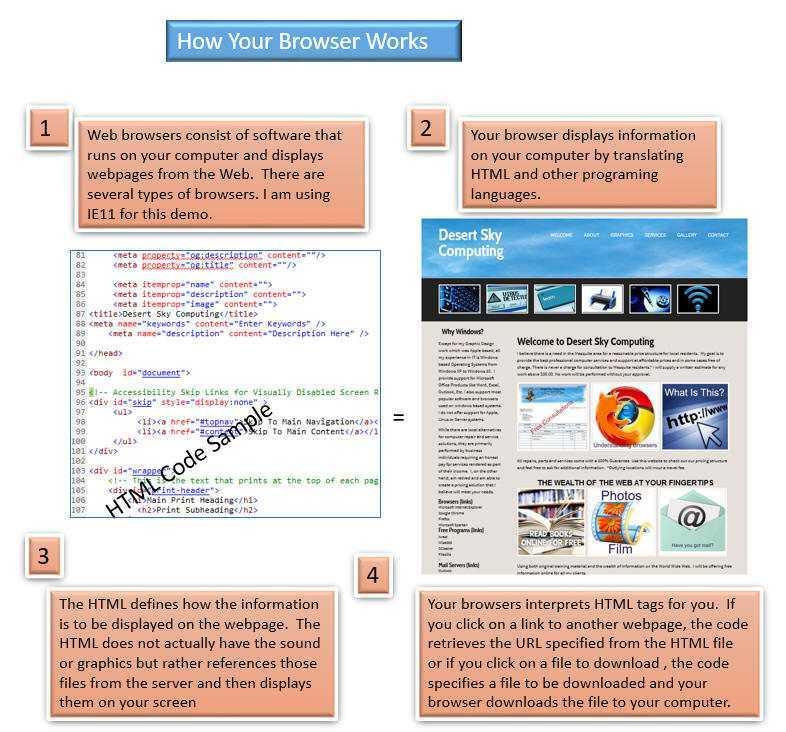 The Chart below shows the relationship of your browser, the Web and your computer. 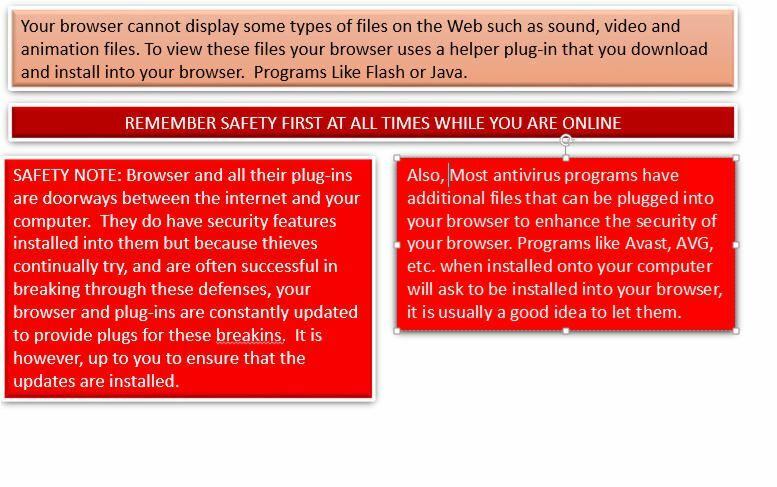 Finally I would like to cover Browser plugins and how they can affect your security, speed and web experience Click to go to Plugins.